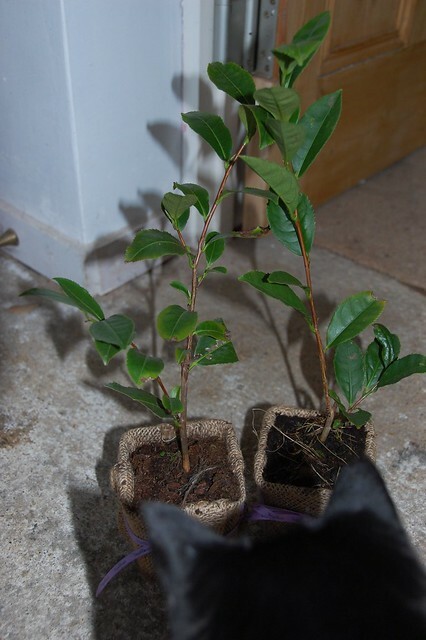 Today I was thrilled that a kind friend living overseas sent me two tea plants from Tregothnan , an estate in Cornwall where they have a commercial tea plantation and botanic garden (open by appointment only). The plants are varieties of Camellia sinensis, Tregothnan don't say which variety but I'm guessing that these are C. s. sinensis, the Chinese form as they are considered hardier than the assamica grown in India. Camellia sinensis is a shrubby evergreen plant originating somewhere between Northern Burma and Yunnan in China but it has been used for so long all over East Asia that it's not known how it came to be a cultivated plant. Left to its own devices it will make quite a large tree 15 metres tall but for tea production plants are kept as bushes to make them easier to pick. It should be easy to grow on the farm as it's considered to be hardy to -10C, likes an acidic soil and plenty of rain. 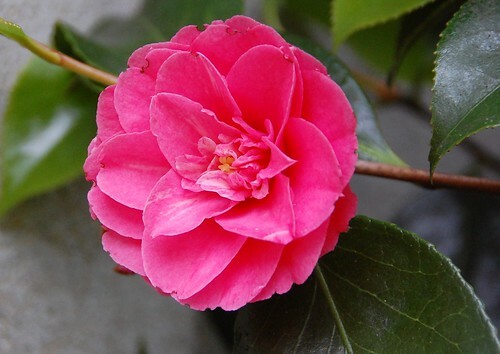 I already have an ornamental Camellia japonica (above) which grows vigorously in the shelter of the northwest aspect of the house. This would probably grow just as well in the open but that little bit of cover helps stop the flowers from frosting, which is always a terribly sad sight when it happens. It's a bit soon to talk about how to process the crop as the plants won't come into full production for six years (if I can keep them that long) but Tregothnan say that trimmings and a tiny tithe of fresh green leaves each year until then can be used in salads and green infusions, so I'll keep you posted on that. I wonder if deer like tea? *By the way, I never tire of recommending the excellent Tea and Kittens Daily Mail blocker. Make your day a little more pleasant by avoiding all contact with that disgusting bit of media.